Ah the humble Gazpacho — about as fresh a soup as they come! Classics are called classics for a reason, amiright?? The perfect way to pack in a ton of antioxidant-rich vegetables that are simply bursting with flavour. One serving has 155 calories, 4g of plant-based protein and 4g of fibre. It also provides a huge 76% and 121% of my daily Vitamin A and C requirements respectively, which is pretty darn appealing when rolled up in such a low fat, low carb package! Tip: Since this soup is raw, try to buy as high quality ingredients as you can, so that the flavour is as full as possible. 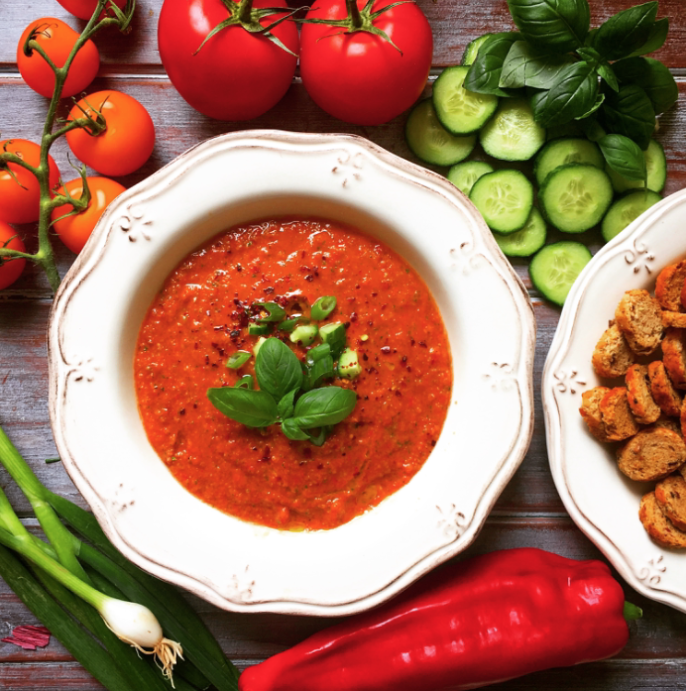 · Chop the tomatoes, red peppers and cucumbers and place in a big bowl. · Cut the bread into small cubes and add it to the bowl. · Add the olive oil, vinegar, basil, salt, pepper and paprika and combine well using your hands. · Add the sundried tomatoes. · Cover with cling film and put in the fridge for half an hour to marinate. · Blend to desired consistency using a stick blender. · Serve with some baked croutons and diced cucumber and a drizzle of good quality olive oil.